*$10 music fee for college students, must show ID at the venue to purchase tickets. On People of the Sun , Strickland blazes down that trail fully at the helm of his music—performing, writing, and producing with his outrageously able Twi-Life band on deck—even as he sonically and socially traces the African diaspora from present to past in an effort to unpack his identity. “I’m thinking about where we came from,” says Strickland, “and how that clashes and goes hand in hand with what we’ve created here as Black Americans.” The result is an album that’s busy and beautiful, inventive and contemplative, an amalgam of influences from West Africa (griot culture, Afrobeat, percussion) and America (post-bop, funk-soul, beat music) performed in the key of revelation. Another facet that sets the album part is Strickland’s lesser-known woodwind obsession with the bass clarinet, which adds its noirish hues to so many of these songs. 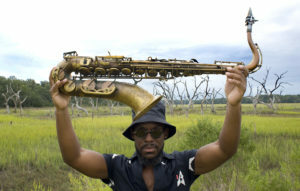 Growing up in Miami, Strickland always thought of music “in a very mixed up way.” He heard Haitian sounds, Afro-Cuban rhythms, and southern rap in the streets, while at home his dad would jump from Stevie to Coltrane to P-Funk on his reel-to-reel deck. Meanwhile, his mom put Marcus and his twin brother E.J. into art school so they’d be surrounded by proper “music nerds.” The talent they nurtured there on saxophone and drums (respectively) propelled the pair on to The New School at just the right time: college was basically one wild jam session with like minded upstarts like Robert Glasper, Keyon Harrold, and Bilal Oliver—guys who’d go on to remake jazz (and more) in their own post-modern musical image. To hear People of the Sun , that backdrop feels more like fate than chance.